One of the last remaining nomadic tribes of the Amazon faces extinction unless urgent action is taken to protect them from violent invaders intent on throwing them off their land, a leading human rights organisation has warned. The rarely glimpsed Awa of the Brazilian Amazon are now considered to be the globe’s ‘most threatened tribe’ as land grabs from illegal loggers, ranchers and settlers displace a people who have lived in the Brazilian rainforests for centuries. First discovered in the mid-1970s, 360 surviving members of the Awa tribe are currently in contact with the outside world, with a further 60-100 believed to be taking refuge in the forests. The Awa are one of the world’s last fully nomadic groups. 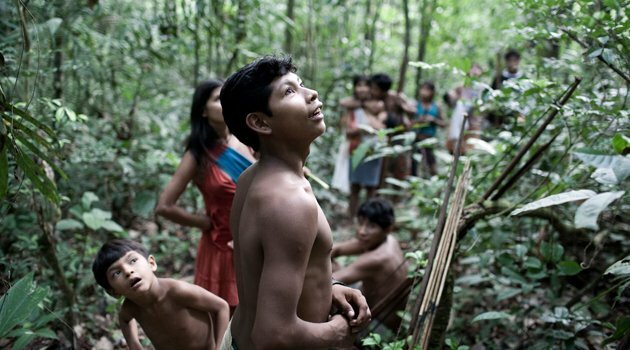 They are hunter-gatherers, relying solely on the Amazon as a food source. The tribe utilises products of the forest in their day-to-day life, using palm leaves to make shelters, clothing and baby carriers, resin from trees to make fires and plants to cure a number of ailments. Campaign group Survival International has been working to protect the Awa since their territory in Maranhao state was opened up to the outside world in 1982 when rich deposits iron ore in the Carajas mountains were first exploited. Indigenous peoples constitutionally hold first rights to land in Brazil, but a programme of rail and road building in the Awa’s territory connecting the mines to the coast ran roughshod over their liberties. According to Survival International’s research director Fiona Watson a third of the rainforest traditionally populated only by the Awa has been wiped out since development first began. New settlers have committed atrocities and brought with them diseases against which the Awa have no immunity. “I have spoken to Awa who have told me that they have seen their relatives being shot in front of their eyes when they were living remote and uncontacted in the forest,” she told Yahoo! News. “Lots of the cattle ranchers and loggers are heavily armed and operate like gangs. These kinds of attacks are happening all the time. “Clearly if you wipe people out then the land is up for grabs for anyone to exploit. Land speculation is a big problem in parts of the Amazon as people are going in thinking if they clear Indians off the land they can lay a stake to it”. Survival International has launched a new campaign explaining the plight of the Awa tribe. It has found high-profile backing in the form of ‘The King’s Speech’ star Colin Firth. In an appeal video released today, the 51-year-old actor pleads for the protection of the Awa caught up in the violence. “The Awá’s forest is being illegally cut for timber, when the loggers see them they kill them,” he says. “Their bows and arrows are no match for guns. And at any other time in history, that's where it would end. Another people wiped off the face of the earth, forever. But we're going to make sure the world doesn't let that happen”. 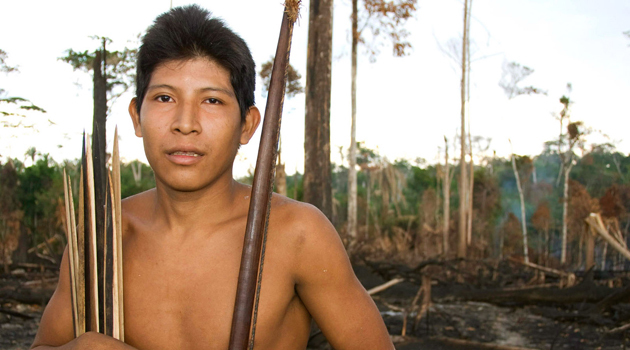 Survival International believes the Brazilian Minister of Justice, José Eduardo Cardozo, can prevent the Awa tribe’s extinction. “We know that with enough of a groundswell anything can be changed. 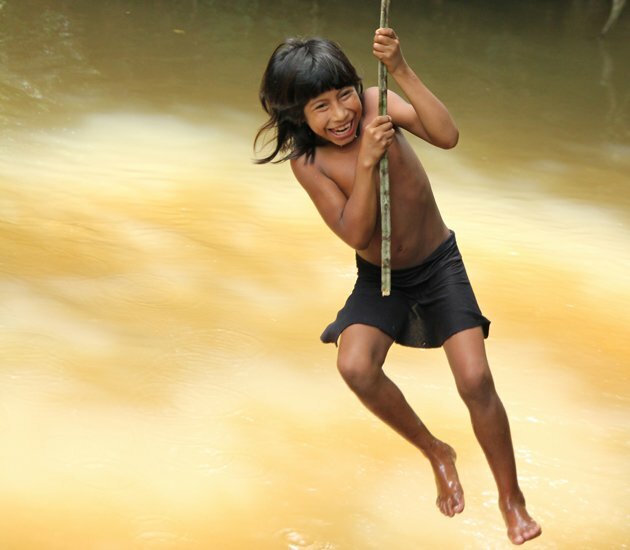 Previously we worked with the Yanomami tribe in Brazil which 20 years ago faced genocide. Fortunately we managed to lobby the government into outlawing gold miners who were poisoning the rivers with mercury. We know the government can help but there needs to be international pressure on them to do so”. “If the Brazilian government don’t act now it could spell the end of the Awa as we know them,” she added. Nigel thanks for posting this. I signed the petition: Link is on the page, above. Thanks to you, we’re up to 12,179 emails. But we really want to reach 20,000. Please—can you send this around? Thanks for posting the link Barb. I have signed the petition and would urge ALL reading this to sign it also. Thanks. So what are you still looking at this for? Go and sign the petition. Hi Mary no U R not ignorant...the page could be set up better. You have to scroll down below about three videos which load up and slow down the page... The petition is there... I think I would put the petition at the top. Thank you for helping Earth's most threatened tribe. Since we launched the campaign with your help, Brazil’s Minister of Justice has received over 18,000 emails asking him to make the Awá his priority. It looks like it’s working: we’ve heard from government sources that he’s preparing to take on the loggers, and the Awá say they have seen monitoring planes in the skies above their forests.